Are you looking forward to give your bedroom a makeover? Well, then the most prominent thing playing in your mind must be the paint color. Everyone is aware of the effect of colors and its significance in creating a cool look for any space. When it comes to the bedroom we are bound to get choosy as this place is our personal retreat where we relax and sleep. It is supposed to reflect our taste and therefore, we look for cool bedroom painting ideas so that this cozy comfort zone gets a classic appearance. Well, there are plenty of shades available in the market that promise to give a unique glow to your bedroom. However, you need to exercise caution as plenty can affect your analytics capacity in a negative way and you might end up choosing a wrong shade. So, it is a good idea to do some prior research and then decide a specific paint color. The post displayed below will help you in this endeavor as it features 27 pictures of bedrooms decorated with different colors. Take a look and choose the very best paint idea for your bedroom. If you liked our selection, perhaps these other posts will interest you too, Interior Design Color Schemes, Dark Kitchen Cabinets, White Kitchen Designs and Walk In Closet Design. This sophisticated room looks all the more enticing due to the presence of vibrant violet shade. If you want a peaceful and pure ambience in your bedroom then try out the pure white shade. Green is the color of nature and brings a rejuvenating touch to your bedroom walls and looks very decent when coupled with a white ceiling. White walls look classic and the clean neutral shade is always in demand for bedrooms as it brings a serene and restful look to the place. This bedroom room uses off white shades to create a soothing look. The large green head board brings a touch of refreshment. Oozing cool as well as warm grace; this bedroom looks very classic with the violet and white shades. The combination of light and dark shades creates a dramatic effect in the bedroom and makes it look catchy. Paint your bedroom with the warm and earthy brown shade to create a cozy and snug atmosphere inside. The designer wallpaper displaying white and gray shades looks very graceful and sober. The passionate red and peaceful white together look very snazzy and produce an enchanting effect in the bedroom. This cute retreat of a child is colored with light violet shade that creates a playful and dreamy ambience in the bedroom. An extremely light shade of orange graces the walls of this bedroom and creates a cozy and restful atmosphere inside. The large glass walls and the white ceiling bring natural light in the bedroom and create an awe-inspiring effect with their neutral properties. Bring a rich and royal look in your bedroom with the purple shade. Adding white on the ceiling tones down the brightness. White color is the favorite of people when it comes to bedroom as it is soft, serene and soothing. This big luxurious bedroom also uses the airy and pleasing white shade to create a meditative and cool atmosphere. White coupled with the rustic yellow shade and the multi-colored striped design creates a stylish and modern bedroom. 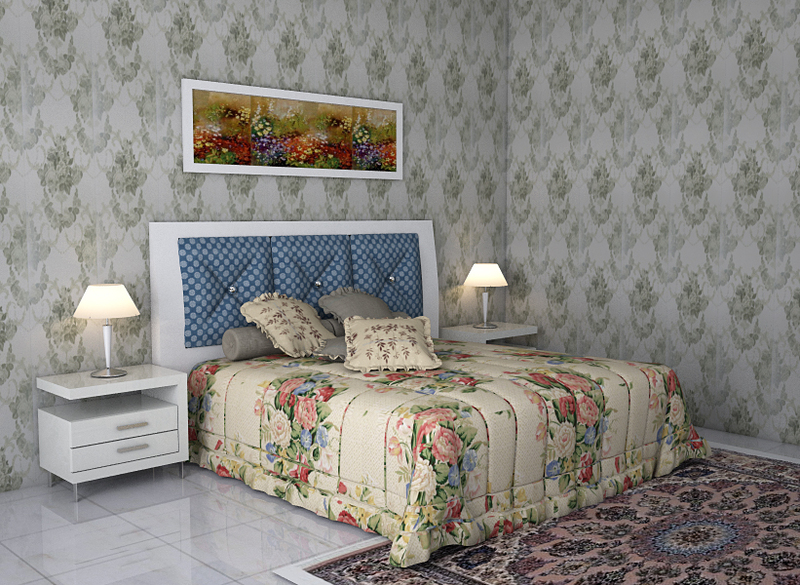 Spacious bedroom designed in an ornate style looks tempered with white walls and ceiling. The cherry blossom trees painted on the walls with red and white shades create a lovely look in the bedroom. Make a bold style statement with your bedroom by getting its walls painted in the mystic black shade. Off white shades and the original hue together bring a semblance of peace and meditation in the bedroom. If you are painting the bedroom of your daughter then you can pick pink without any hesitation. Beige, cream and white shades are known for their calming effect and the same gets transported to a bedroom when the walls are painted with these colors. Light pink and white shades look soft, smooth and romantic. This bedroom is perfect for spending a romantic night. The light green walls and the white ceiling create a gentle and restful look for the bedroom. Violet is in-vogue, when it comes to bedroom paint ideas. It has a glamorous and playful appeal that sparks up the imagination. The light green and white shades create a fresh and composed look for the bedroom.